The annual general meeting of the West Lancashire Freemasons’ Charity was held at Wellington Park, Leyland. The Chairman of the board of Directors, Mark Matthews opened the meeting. He welcomed the brethren and thanked them for taking the time to attend the meeting. Pictured from left to right, are: Tony Harrison, Steve Kayne, Howard Lloyd WLFC Finance Manager and Simone Enefer-Doy. Mark introduced his fellow directors and thanked them for attending. He then introduced the President of the WLFC and Provincial Grand Master, Tony Harrison. Pictured from left to right, are: John Gibbon, Colin Rowling, Barrie Crossley and Derek Parkinson all of whom are WLFC Directors. Pictured from left to right, are: Steve Kayne, Simone Enefer-Doy, Martin Walsh and Tony Harrison. Tony recounted his first visit to the AGM as the new President in 2014 when the same room was full with over 100 brethren in attendance. Tony said that he was looking forward to hearing the two key speakers and he hoped that next year’s meeting would be better attended. Tony then introduced Steve Kayne CEO of the WLFC. Steve spoke about the change the WFLC had undertaken on 1 April 2018 by becoming a limited company, which would remove the financial risk that the trustees had previously had before they became directors of the new limited company. 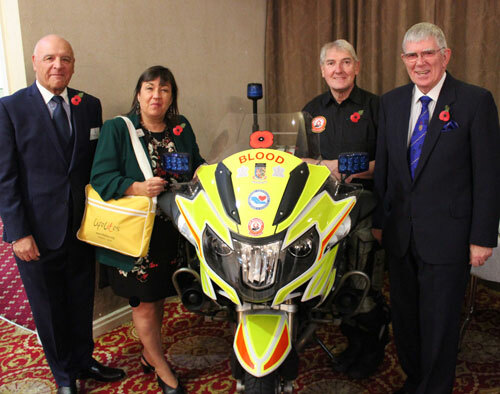 Steve then introduced the first of the two guest speakers – Simon Hansen (North West Blood Bikes Transport Manager). Steve Kayne is pictured giving his presentation. Simon told the meeting about how they support the NHS out of normal hours (7pm to 2am) in the week and 24/7 at weekends. He said they respond to over 1,000 calls a month, which their 350 volunteers respond to using their own motorbikes and cars and the liveried motorbikes. 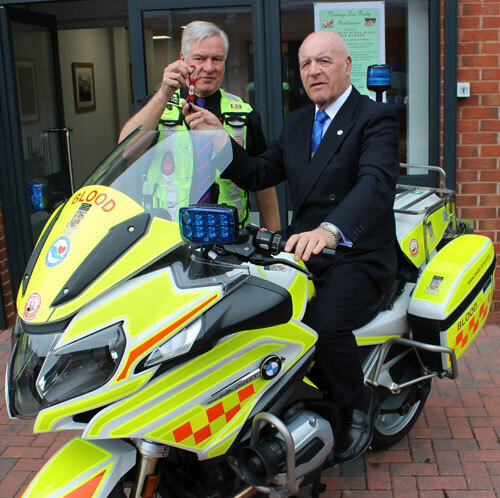 The 12 liveried motorbikes NWBB have are used for calls that involve Motorway, long distances, during rush hours and calls moving urgent blood samples and other lifesaving items. Simon Hanson and Steve Kayne are pictured earlier this year when the two motorbikes were delivered to NWBB. 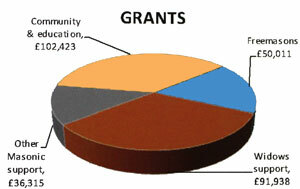 To cope with this level of calls, the organisation has five bases in the North West. North, (covering Lancaster, Kendal and Barrow). Central, (covering Preston and Chorley). West, (covering Ormskirk, Southport, Blackpool and the Fylde) and East (covering Blackburn and Burnley). Two liveried motorbikes are located in each base with 3 in the North. For more information about NWBB go to their website: www.nwbb-lancs.org The two bikes the WLFC donated earlier this year were on display in the conference room. Steve then introduced Simone Enefer-Doy, CEO of the Lifelites Charity. Simone told the assembled brethren all about the work her organization does by providing state-of-the-art life-changing assistance technology to 60 children’s hospices in England, Wales, Scotland, Northern Ireland, Ireland and the Islands. Three are in the Province of West Lancashire: Derian House in Chorley, Zoe’s Place and Claire House which are both in Liverpool. Simone continued: “Lifelites gives severely disabled or life-limited children opportunities they wouldn’t otherwise have. Many of the children who benefit from the Lifelites technology suffer from very limited movement and are often unable to manipulate and control anything for themselves, leading to limited communication with others and a sense of isolation. If you’ve been to a children’s hospice, you will know that they are happy places, full of life and fun and activities and Lifelites is aiming to partner. Children and their families can be referred to a children hospice at the time of diagnosis and they may visit for respite care and other support over many years and received support with end of life care too. Our aim is to give these youngsters technologies which are really going to enhance their lives, all sorts of special accessible tech which is going to help them to join in with the world around them and escape the confines of their conditions. The Lifelites technology provides specialist entertainment and educational packages for young people to learn, play, be creative and overcome some of those restrictions, helping them to interact with friends and carers, encourage social development and relieve isolation, as well as providing an opportunity to have fun and enjoy life, for as long as it is possible. Finishing her presentation Simone presented Steve and Tony with a certificate to mark the donation made to Lifelites by the WLFC when she visited the Province earlier in the year. In the picture on the left – Simone Enefer-Doy is pictured giving her presentation. In the picture on the right – Simone is pictured presenting the certificate to Tony and Steve. Mark closed the meeting by thanking Simon and Simone for the enjoyable and informative presentations.